As you are. With a mustache. –Oh, I published a book! –You don’t say! What kind of book? –It has something about you, too. –Not the book, but a whole chapter? –And what do I look like in it? –As you are. With a mustache? Have you seen him lately, the devil? 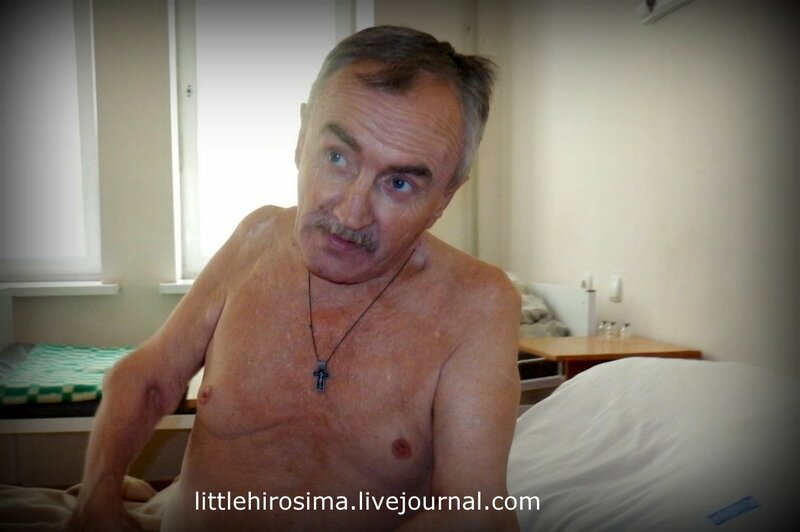 Seryozha had a heart attack in May. He’s been taking many preparations due to his progressing polyarthritis which, unfortunately, also affect his heart. The doctors prescribed a whole range of medications which he’ll have to take for the rest of his life. His retirement home can only partly fill these needs, and even then with poor substitutes. We’ve been taking care of Seryozha since the spring of 2015. I don’t like that phrase, though, all the more since Seryozha has become very close to us. But I don’t even know how else to phrase it. 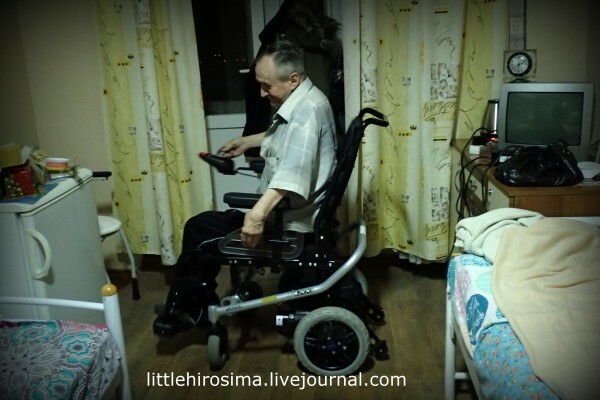 Seryozha lost his home in Khryashchevatoye due to the shelling in the summer of 2014, and then also his leg due to the trauma and illness that he’s had for a long time. 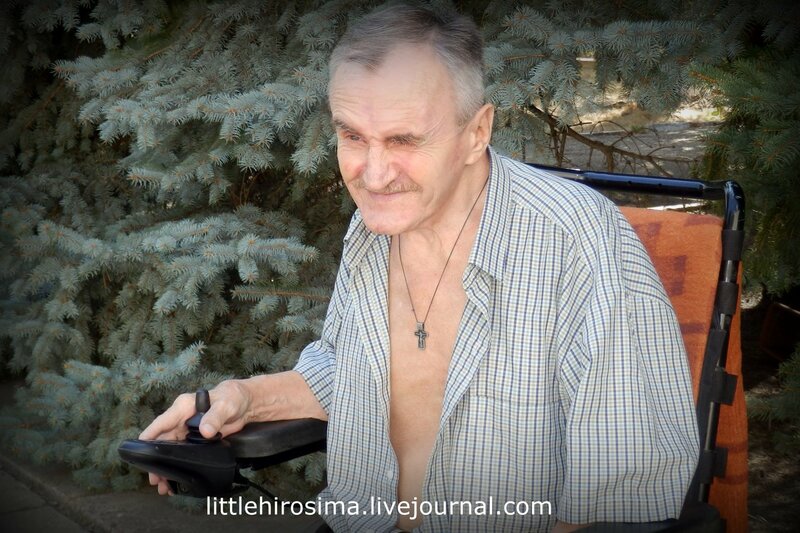 He now lives in a retirement home in Lugansk. 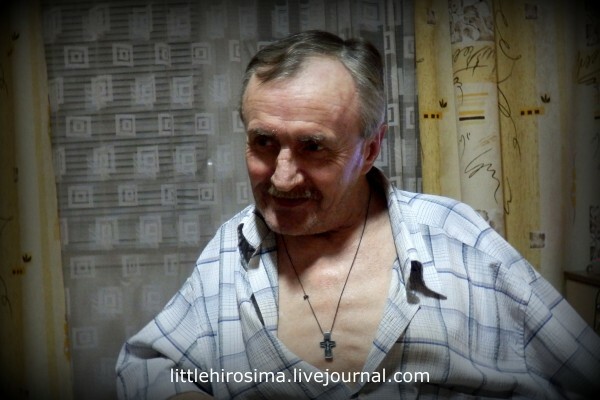 To read more about Seryozha, click on the “Kutsenko” tag at the bottom of this post. And now he’ll need these medications regularly. 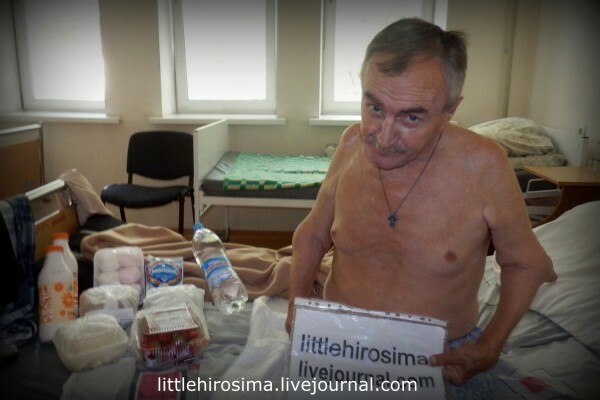 Please label any contributions intended for Seryozha “Kutsenko”. Maybe I’ll tell you about Seryozha? Stories Seryozha are simply stories about a distant uncle. Perhaps that’s why I’ve written fewer and fewer stories about him. Some stories are not suitable for public consumption, others have been written so many times it’s becoming awkward. Seryozha Kutsenko probably got the biggest chapter in my “People Live Here” book. Seryozha is sad and is very bored in the retirement home. Even though one can’t call it an ordinary retirement home. That’s the message I recently got from our Seryozha Kutsenko. He’s been traveling since morning till the evening, up and down all kinds of ramps and trails. What can I say–last year, he’s been outside only a few times between October and end of April. Ramps are so steep that he couldn’t ascend them on his own. He’s embarrassed to ask the nurses, and they are not always available anyway. Sergeant Kutsenko, hit the road! 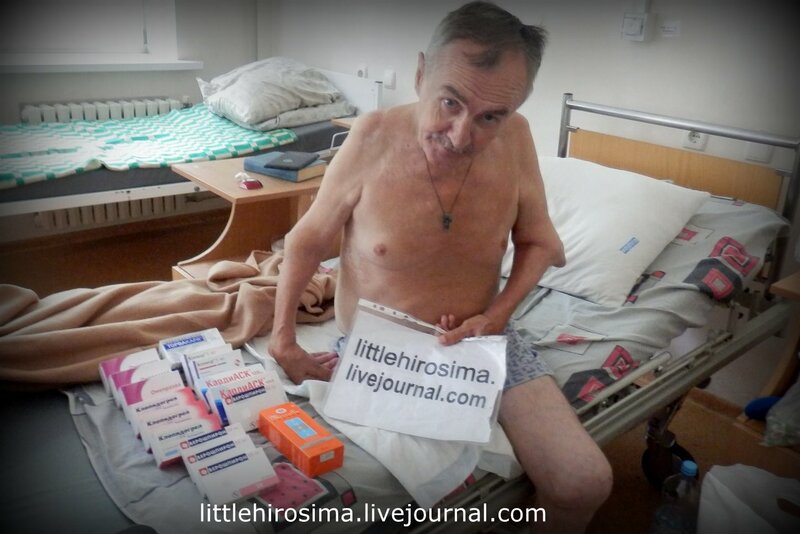 Perhaps I should tell you about the main reason for this trip to Lugansk? One evening, when I was already falling asleep, I got a letter from Natasha. Her profile photo shows an unbelievably beautiful blonde–I had no idea. “Dunya, tell me, how are things with the wheelchair for Seryozha Kutsenko?” How are things? They are nowhere. It’s expensive, I say. Electric ones are like that. Can’t collect enough money. We started with looking at a used, cheap one, and ended with a cool German brand new one that’s insanely expensive. This lovely lady totally stunned me, and on top of that keeps saying there’s no need to write about it. Yeah right, Natasha. I’ll post the best photo right here. Let others envy me. All in all, we managed to get it by Seryozha’s birthday (actually a couple of days later) and went to surprise him. I was so stunned by the call that I fell silent for several seconds, forcing Seryozha to explain who was calling. But I recognized him right away. 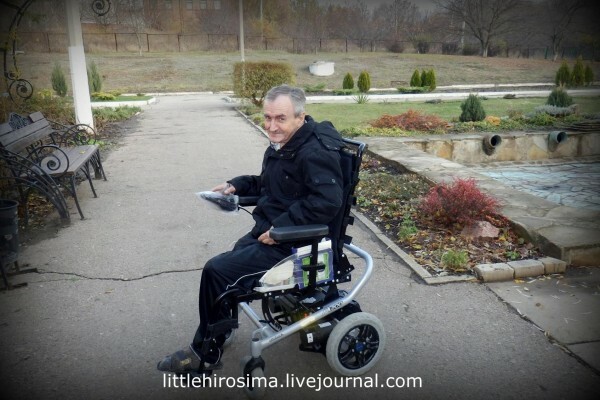 –Seryozha, good to hear from you! It turned out he also called our Moscow Zhenya. He spent most of his pension, half of which goes to the retirement home, on calling us. We haven’t written about Seryozha a lot lately, he usually gets a mention in the general reports. 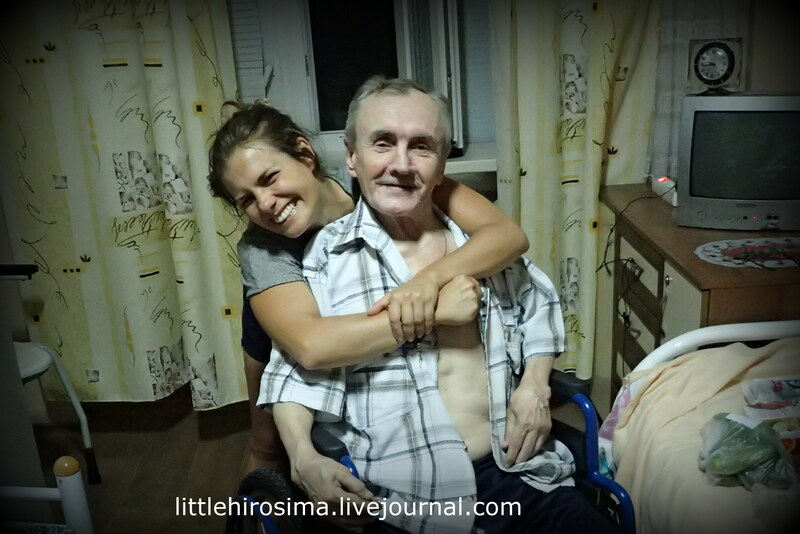 Lena is trying to visit him as often as possible in the retirement home in Lugansk. Seryozha is sad. He’s had problems before the war, but the amputation of his leg in ’15 broke his life. We already wrote last year he finds it difficult to be alone and confined to a wheelchair. He’s not strong enough to roll up the ramp into the home. He has polyarthritis, after all. So he can’t traverse any obstacles without help. And yet there’s a lovely forest park right next door. He’s very sad and asks about us and Zhenya all the time. Time has stopped at the Retirement Home. It flows slowly, unhurriedly. How does one explain Seryozha to new readers? We met him 1.5 years ago in Khryashchevatoye which was nearly completely bombed out by the UAF and NatsGvardia. Streets were in ruins. Houses were in ruins. We ran into him by accident. And, by the will of fates, we saved his life. That’s how it turned out. Read here. 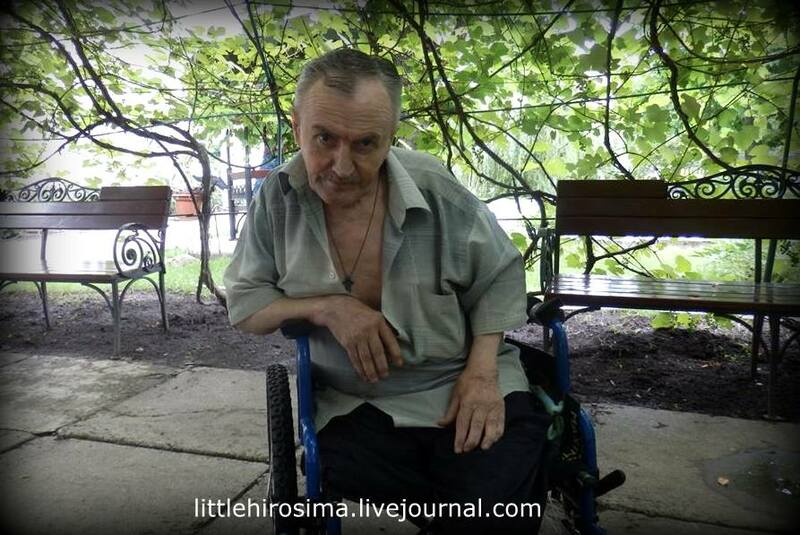 Seryozha lost his leg, his home. But still had polyarthritis. I was not the only one to celebrate my birthday recently. 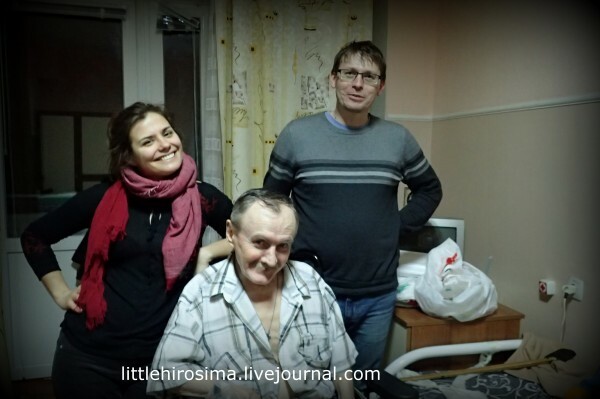 The guys caught up with our Kutsenko in the retirement home hallway. It so happens Zhenya and Lena were still in hospital on his birthday so could not convey birthday greetings on that day. 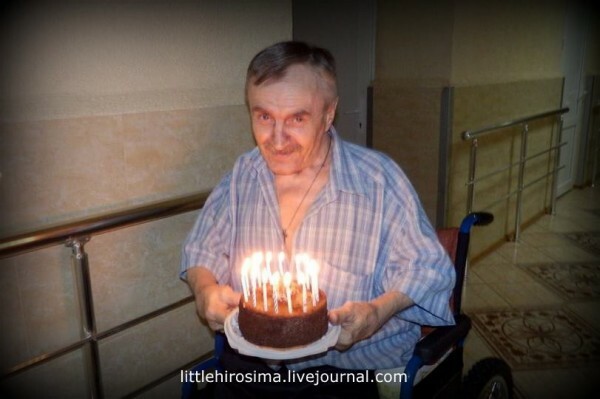 But they arrived without warning later, found him, and surprised him with a huge cake with candles, and with presents.